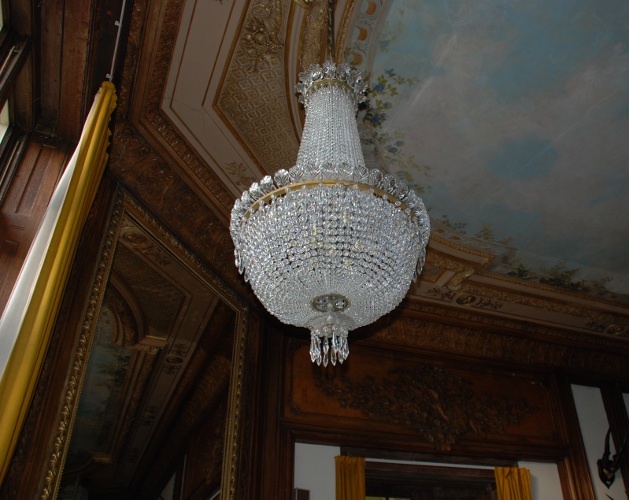 We would be pleased to clean or rewire your chandeliers or lighting fixtures to bring them back to their former glory, so if your chandelier has lost its sparkle or has aged wiring please get in touch. The process of restoration can be looked at from different angles. If you have a Chandelier which for instance just has a few broken pieces then it is normally quite a straightforward process to make the repairs yourself. The main difficulty is finding the right parts to match the existing. We can obtain the parts for our chandeliers and indeed you might find that these are suitable. Often you may not be able to match a specific crystal or dish so the best answer will be to change the set so they match. Quite often a chandelier can look beyond repair but on closer inspection then by remaking a few crystal chains and chandelier cleaning then it can be returned to its original glory. 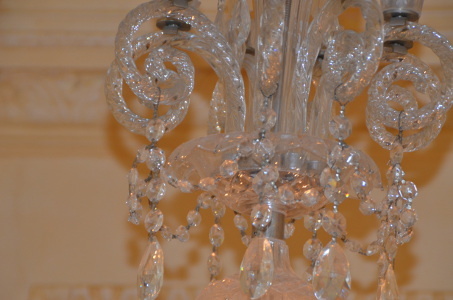 One technique that we find particularly successful is to replace old low grade crystal with out high quality leaded crystals which really can transform a plain light fitting into a fine specimin. So please ask us if you would like a second opinion. This is a fabulous example of an beautiful old traditional chandelier which is hung in a historic building. This traditional chandelier had not been touched for many years but was just hanging in the library as a memory of times gone by. 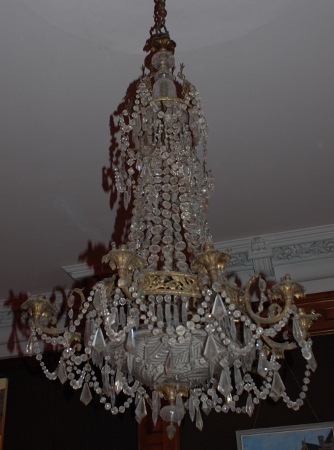 The chandelier was very dirty, the wiring was disintegrating, there were many broken chains and crystals missing. Chandelier cleaning and restoration was definitely needed! If your chandelier has been hanging for a few years, or less in a dusty environment, then the crystals will get covered and this will mean that they will lose there sparkle and light reflection characteristics. This will invariably happen gradually over a period of time so you may hardly notice! The process of cleaning the crystals is relatively straightforward. You first carefully detach the crystals and then wash them in a mild detergent and them hang them back in place. If you have high quality lead crystals you will be amazed by the difference that this will make. Now before you jump in and start your chandelier cleaning, there are some important considerations. Firstly, make sure that you have made a diagram of how the light goes together as certainly for larger specimins it may not be obvious now to reassemble. Secondly, ensure that you can access the light with safety standing up a secure base to either remove the crystals or take down the entire light fitting. Again if in doubt call in the experts. Rewiring is not something that people would undertake themselves. It does require specific knowledge of how to dismantle the chandelier together with the correct components and rewiring expertise. If you have a light that does need rewiring then we would be happy to provide a quotation. And just to say whilst this featured project does demonstrate our capability a lot of the chandeliers we wire are far more modest than this beauty! 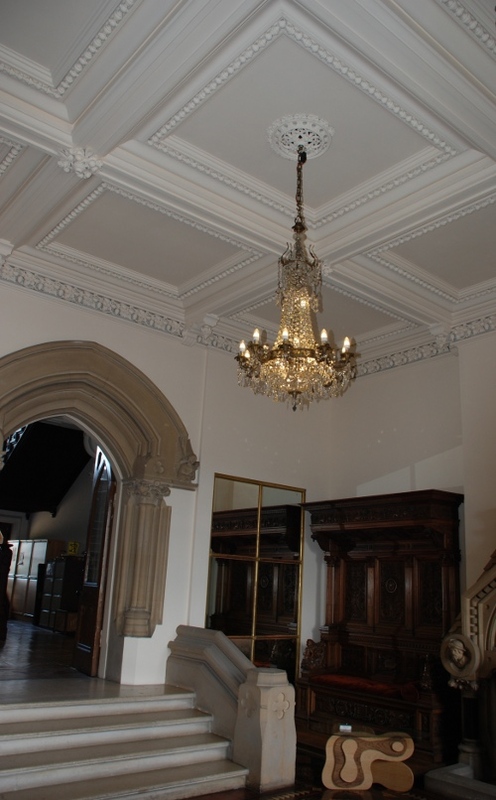 The restored chandelier takes its place in the grand entrance hall after chandelier cleaning and restoration. 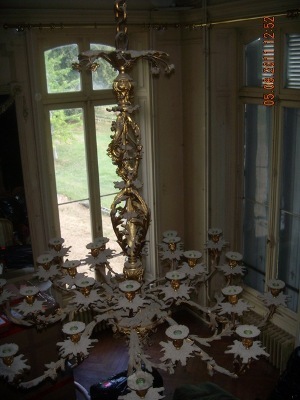 This fine chandelier was rescued from auction and is now destined to be returned to its place if origin in a fine Chateau in France which is being faithfully restored by its new English owners. The pictures below show the light before restoration on the left and after restoration and wiring in our workshop on the right. As you can see the illuminaire was originally lit by candles and whilst this is very romantic this is not practical these days. We took this fine example in for restoration and meticulously cleaned it, fitted lamps holders with fine glass candle tubes and wired the light with flame shaped candle bulbs so it could be used as a practical source of illumination in the Chateau. 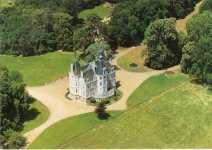 There were in fact 2 chandeliers of this type we restored and they are now back in position returning splendour to this fabulous chateau. This fabulous historic building has a fabulous dining hall which is ornamented with 3 magnificent basket chandeliers of truly grand proportions. 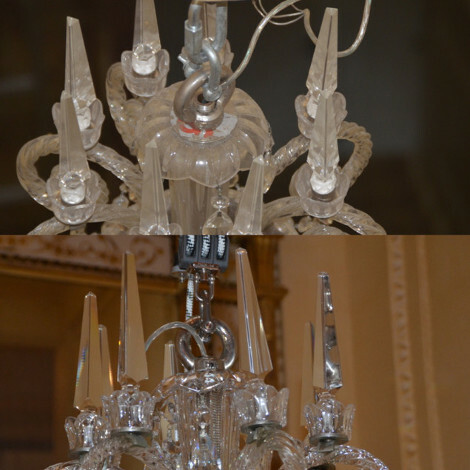 These were looking very dirty with many crystals missing and wiring in a poor state of repair and definitely in need of chandelier cleaning and refurbishment. We removed the chandeliers and then dismantled them to thoroughly clean them. This was the a good opportunity to rewire the chandeliers update the bulb holders and return the chandeliers to light the room in the manner they were accustomed to when originally made. Now we recognise that the examples shown here are quite grand but we also conduct rewiring and chandelier cleaning on small chandeliers and light fittings from peoples homes of all sizes. So if you have a light which is looking unloved whether it be grand or petite then please do get in touch regarding chandelier cleaning. 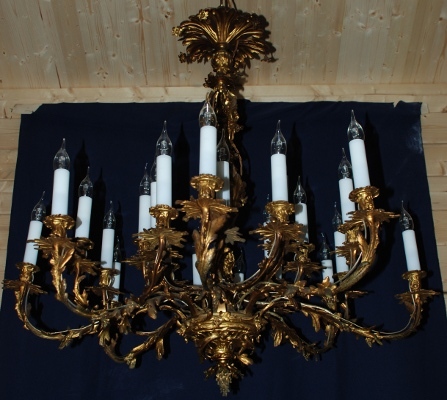 We were given the task of cleaning a beautiful traditional bohemian style chandelier. This was no small task however, because due to its size and how dirty the chandelier was, it was a difficult and long process. 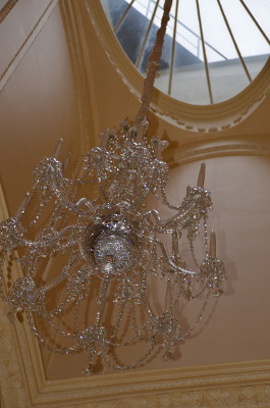 As you can see from the pictures above, the chandelier was far from sparkling and gleaming before we got to cleaning it! The hard work really paid off though, and the difference between how the chandelier was and now is, is definitely evident! The entire chandelier was covered in a layer of dirt and dust which hid its elegance and beauty. It definitely looked worse for wear! 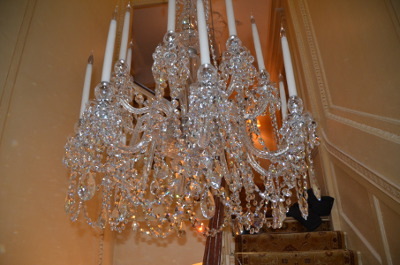 The chandelier is hung in the stairwell of a residential property in Mayfair. It is positioned directly over the handrail of the staircase which meant it was difficult to take it down directly. The entire chandelier had to be taken apart in order for us to be able to take it down without damaging it. The trimmings were the first aspect of the chandelier we had to remove. These then had to be packed and marked to ensure we knew where they hang on the chandelier. Next came the arms and central stem, which, like the trimmings had to be wrapped and packed carefully in order to prevent any damages. There was already previous damage to one of the dishes which meant extra precautions had to be taken in order to prevent any further damage or breakages. There is a lot of pressure and sense of responsibility when it comes to taking chandeliers down because of how fragile they are. It can be so easy to make a mistake and break them. They are so precious; any possible care that can be taken definitely is when it comes to the handling of chandeliers. Once it was dismantled, we then stored the chandelier for a number of weeks while the rest of the Chelsea home was being refurbished and renovated. We offer this service for any number of chandeliers, for your convenience we store them while we clean them. 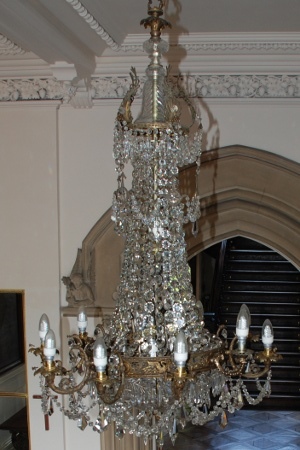 The cleaning of this particular chandelier was a huge job due to how dirty it was – as you can see from the pictures – and also because of the size of the chandelier. It was a time consuming job but undeniably worthwhile when you see the transformation and knowing you were a part of the giving the chandelier back its sparkle.